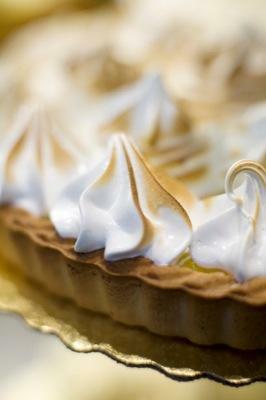 Looking for meringue pie tips? If you're looking for meringue pie tips, there are lots of things you should know. This light, fluffy topping is easy to make, but there are lots of pitfalls and caveats that you should be aware of before starting your project. With a little care and thoughtfulness, you can make the perfect meringue pie that your friends and family will love! First of all, it's important to understand that making meringue is a very fragile process. Several factors contribute to the light, airy texture of meringue, and if any foreign substances get into your mixture, the whole thing will literally fall flat. When making meringue, you need to make sure that your equipment is very clean and free from oil and grease, since any fat in the mixture will cause your foamy meringue to collapse. This means that you should clean your bowl and beaters with hot soapy water before beginning your recipe. Since plastic bowls and utensils are known to hold onto greasy substances, it's better to use equipment made from other types of materials, such as metal, glass or ceramic. It's also a good idea to keep from touching your equipment too much, as even the oils from your hands can inhibit the formation of a good foam. Meringue doesn't like moisture, so make sure that all of your equipment is completely dry before using it. You may find that you'll have a hard time making meringue if it's a particularly humid day, so try to save these projects for days where there in less moisture in the air. There are only three things in a basic meringue recipe: egg whites, sugar and air. You might think that air is a weird ingredient to have in a recipe, but without air there would be no meringue! When you beat your egg whites at a high speed, you're essentially mixing them with a lot of oxygen, which causes the protein in the eggs to unfold and expand. You're whipping in a lot of air, which causes a foam to form as the egg whites to expand to many times their normal size. A huge part of the structure of meringue is the tiny air bubbles that you create when beating the egg whites, and without them you wouldn't have any lift. It's always a good idea to use superfine sugar, since it dissolves faster. You can either buy superfine sugar at the grocery store, or you can make it yourself by pulsing regular white sugar in a food processor a few times. Make a perfect lemon meringue pie! Sugar, another important ingredient in the equation, helps to stiffen the foam and keep it from collapsing easily into a pile of thin froth. You need sugar to help maintain structure as it thickens the egg whites without adding any extra weight. Make sure that you do not add your sugar until you have already beaten your whites to soft peaks. Adding sugar too early will inhibit the forming of foam, and it may take much longer to whip the egg whites into shape. When it comes to meringue pie tips, a bit part of the process is preventing egg yolks from getting into your whites. This can be a big problem if you're not careful. Since there are only three ingredients in meringue, anything else will cause the whole process to fail. This includes even a tiny bit of egg yolk that may get into the egg white mixture. It's a good idea to have two bowls for separating eggs - when you break open and separate a new egg, do it over an empty bowl. Once you know that the separation was successful and you did not get even a drop of yolk into your white, you can pour the white into a larger bowl that will hold the rest of your egg whites. This way, if you accidentally break the yolk while you're separating the egg, you won't contaminate the entire bowl of whites! Cold eggs separate more easily, since the yolks are more solid and have a lower chance of breaking. Once you've separated the eggs, let your whites come up to room temperature since warmer eggs whip up to a good foam faster than cold eggs do. It's a good idea to leave your egg whites out in a covered bowl for at least 30 minutes after they've been separated.